The Bank Tavern | Pub Quizzers | Find a pub quiz near you, now. 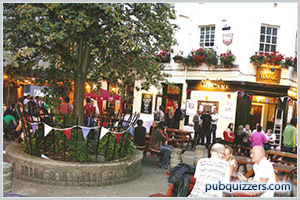 Pub quizzes take place at The Bank Tavern, Bristol on Tuesdays (weekly) at 20:30. Entry is £1.00, you can have up to 6 people on a team. There are prizes of cash. Happy quizzing! The weekly quiz that specialises in anything and everything. 6 rounds including intros round, picture round and always finishing off with a connection round. Like the Facebook page to submit any custom rounds you would like to see. Previous custom rounds have included The Lord of the Rings trilogy, Harry Potter and Marvel films to Pokemon, Bristol and Nicolas Cage! Winning team wins half the pot. The other half will be put into the Super Jackpot where you answer a Super Hard Question. Answer that correctly, win the Jackpot. Since this has been running only one team has won the jackpot, walking away with nearly £300! Free pizza for every team.